Wow! The count down has begun for our move. You can read more about it here.We have about 9 days left in Little 'ole Vermont. I have one more day left at my job, which is super sad. I'm really going to miss everyone at my work. Funny Story! So lately at work I've been really stressing out about moving (there's so much to get done!) and whenever I feel like it's just too much, I take a break, get on my phone and look up the humor section on Pinterest. This is great.....at first. Then I start to realize that all the giggling (that I think is in my head) is actually out loud. So I look like the crazy girl sitting alone giggling. It's gotten to the point where I just share what I'm laughing at. Makes me feel a bit less crazy. How can you not love this cat!? The caption is perfect too! So this is what me & my daughter do when we go school clothes shopping for my son. My wife is a big tom boy, so I leave all the boy clothes and stuff up to her. So my daughter and I usually grab a bunch of clothes and try them on. We were in this super obnoxiously pink dressing room as you can see. As we were browsing we came across matching Hello Kitty shirts! Now the idea of being twinsies is cute, but the reality is never as awesome as it seems in your mind. I did end up getting my shirt...it was only $2!!! I have no idea how I run into these deals? This will probably be me when I get old. 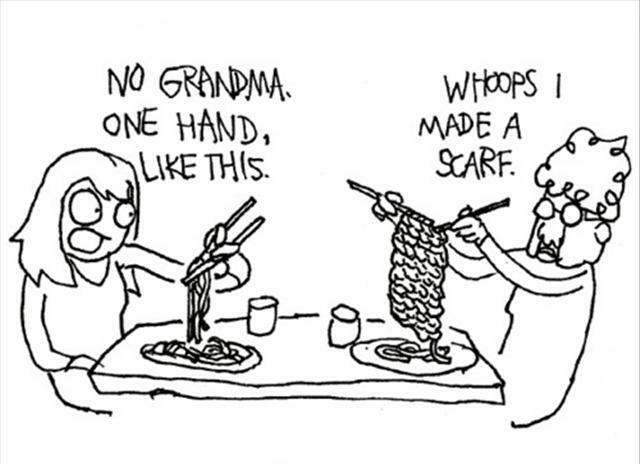 I'll totally forget how to use my chopsticks and just start knitting with my noodles. Hopefully I'll remember to eat the noodles when I'm done...haha! I hope your all having a great week! Tomorrow is Friday.....Woohoo!